The man charged in a failed pipe bombing in the New York subway system has been convicted of terrorism charges. Marc Santia reports. The man charged in a failed pipe bombing in the New York subway system has been convicted of terrorism charges. The verdict against Akayed Ullah, 28, was returned in Manhattan federal court after a trial in which the defense maintained he intended to kill only himself last Dec. 11. Nobody died, and most of the injuries were not serious. After the verdict was announced and the jury left the room, Ullah spoke out, telling the judge: "I was angry with Donald Trump because he says he will bomb the Middle East and then he will protect his nation. So I said: 'Donald Trump, you cannot do like this.' Nobody likes bombing, your honor." Judge Richard Sullivan told him: "Right now is not the time for a statement." Ullah repeatedly told Sullivan he did not carry out the attack for the Islamic State group. Ullah's attorneys declined to make a statement as they left the court Tuesday. Prosecutors said Ullah sought to maim or kill commuters in response to calls for "lone wolf" terrorist attacks by the terror organization. "Your honor, you heard what the government is trying to do. They are trying to put me in the group, which I don't support, your honor," Ullah told Sullivan. "Mr. Ullah, now is not the time for this," the judge told him. Sentencing was scheduled for April 5, when Ullah faces a mandatory 30-year prison sentence and could be sent to prison for life. In a statement, U.S. Attorney Geoffrey S. Berman said the Election Day verdict after an attack in which Ullah sought to make a political statement through deadly violence "fittingly underscores the core principles of American democracy and spirit: Americans engage in the political process through votes, not violence." 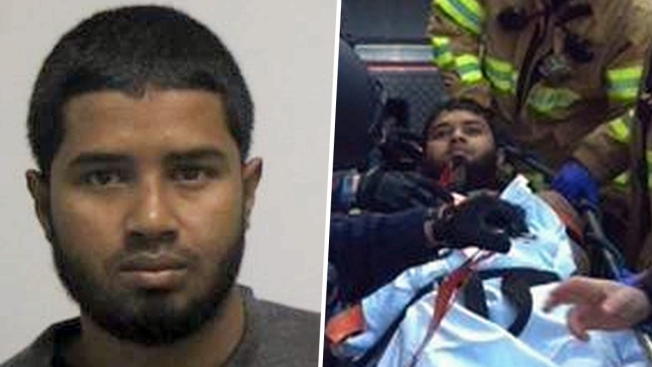 At trial, prosecutors said Ullah would not have worn a bomb had he wanted to kill only himself. They also cited social media postings by Ullah, as well as comments he made after his arrest to investigators. At trial, Ullah was confronted with his post-arrest statements and his social media comments, such as when he taunted Trump on Facebook before the attack. The president later demanded tightened immigration rules. Authorities said Ullah's radicalization began in 2014 when he started viewing materials online, including a video instructing Islamic State supporters to carry out attacks in their homelands. The prosecutor said Ullah, of Brooklyn, followed the propaganda of the Islamic State group online and obeyed its instructions to attack Americans. Gallicchio, though, said Ullah purposefully chose an isolated corridor to set off his bomb because he only wanted to commit suicide. "This is not a terrorist attack," she argued. Assistant U.S. Attorney Shawn Crowley disputed the claim.